AUSTRALIA’S contemporary music scene is very much alive and well if a batch of recent releases by the local Tall Poppies label is anything to go by. 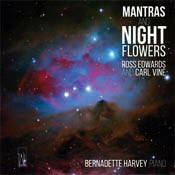 Two of our best living composers, Carl Vine and Ross Edwards, feature on a magnificent solo album by pianist Bernadette Harvey, Mantras and Midnight Flowers. The disc gets its name from the opening work, nine gorgeous miniatures by Edwards, here given their world premiere alongside his three-movement Piano Sonata. The Mantras vary in mood and style, from the composer’s trademark dance-like motives to more contemplative studies which evoke the sound worlds of Debussy and Ravel. The composer was on hand to supervise the recording of these works and the more substantial but equally accessible sonata. Vine’s Piano sonata No 1 has been recorded twice for Tall Poppies already by Bernadette’s brother Michael, both on a Stanley and a Steinway piano. For her recording Harvey has chosen a Fazioli piano, a brand championed by Angela Hewitt among other top pianists. This two-movement work is a virtuosic challenge, full of invention and ideas and restless rhythms which generate a feeling of great excitement. The 12 Anne Landa Preludes show Vine’s mastery of the piano as well as his distinctive musical voice, albeit with a little detour into Bach-like counterpoint in the 11th prelude. This is a deeply satisfying and well thought out program with the miniatures book-ending the more substantial works from two composers with a lot to say to their audiences. Harvey’s playing is faultless. Drop the needle (a technologically outmoded term for ‘guess the composer’) on any of the 26 tracks here and you’re bound to guess the two featured Australian composers: Ross Edwards and Carl Vine. Peter Sculthorpe and Larry Sitsky aside, each of these composers has given Australian piano music a contemporary persona and voice. There’s a neat symmetry here: each is represented by two works, separated by two or more decades. And yet the sound language of each composer is consistent and instantly recognisable. The 30 minutes of Edwards that opens this album, the titular Mantras and the Piano Sonata (2011) embody his ‘Maninyas’ dance-style, tripping off the keyboard with elan and elegance, as though Bach were playing gamelan. Vine’s Sonata (1990) and Anne Landa Preludes (2006) reveal that masterly understanding of the piano which characterised Vine’s exhilarating Flederman performances of Carter and others in the 1980s. Here there is nostalgia, a composer looking back at key moments of his pianistic life, but devoid of brooding sentimentality. Bernadette Harvey captures the gamut of moods and ruminations of each short piece with authority and even fun. Her playing is pure and lean, even when Vine’s textures suggest otherwise, finely articulating his interlocking rhythms and inner and outer lines, ever wary of over-pedalling. Her dynamic performance is just as exhilarating as that of her brother Michael performing it for the Sydney Dance Company in 1992. The recorded sound is crystalline and gratifying to the instrument. I have very strong memories associated with the music of Ross Edwards and Carl Vine. I listened spellbound to Edwards’ Dawn Mantras, the sheer beauty of it, those sublime climactic notes from Jane Sheldon, as it was performed for the Dawn Service, part of celebrations around the world with the new millennium for which the piece was written. Later, riveted, I enjoyed reading about and unpacking the symbolic gestures and structure of it and worked with it many times with students. It was a purely musical indulgence for me. My pivotal Vine experience is much more associative. I sat on the floor outside the ICU at the Epworth hospital in Melbourne waiting to be allowed entry to see my son and I had headphones attached listening to Vine’s String Quartets which I was reviewing. I could say it blocked out the hospital atmosphere, but rather, it was just unbelievably moving. There are, of course, signature passages in Vine’s works and in listening now to hisPiano Sonata No. 1, the furrows in my bones, remnants of this experience, run a little deeper. It’s strange then that what differentiates these two composers the most is that Edwards is almost always inspired by imagery – a person, a place, an aspect of nature. Even when he starts out writing from a sonic stance, his descriptions become metaphoric. There are always reference points. Conversely, Vine’s work, affecting me in that instance associatively, is most often purely concerned with sound. Any references tend towards the philosophical even when talking about spiders! He thinks in abstractions. Renowned Australian pianist, Bernadette Harvey, brings both incredible virtuosity and sublime subtlety of articulation to her interpretations of the works on this album which are organised like bookends. It is such a generous CD of 72 minutes’ duration and there isn’t one second the listener would wish to be denied. The contrasts between the pieces in Edwards’ Mantras and Night Flowers are stark. “Snails Bay Mantra” was written for Bruce Beresford. It is minimalistic and meditative in its use of cyclic motifs and repetition and Harvey deliberately keeps it in check throughout. We are then thrown headlong into a piece called “Frangipani” which started life as a set of variations to one of Liszt’s Hungarian Rhapsodies. Like me, Edwards found the Liszt a little, um, twee, and altered the theme by using a Japanese scale, diluting the strong sense of tonality and chromaticism – hence, Franz Japani. One of the delights throughout the album is the surfacing of both composers’ humour which is, on occasions, LOL. I’m a sucker for Japanese modes –well most aspects of the Japanese aesthetic are pretty irresistible. It works so well here because Edwards is able to use the romantic expressive devices including arpeggiated left-hand passages, rhythmic complexities between the hands, big chords and big dynamic changes whilst retaining (with respect to Mr. Liszt) artistic integrity! And Harvey is able to let go here, exploring the romanticism to her heart’s content. “Pipyamyum Mantra”, originally written for singer and pianist Hartley Newnham, explores one of the major themes in Edwards’ Maninyas 1, most famously recorded by the SSO under the baton of the late and revered Stuart Challender. It was his last recorded work. I have never heard music sound so ‘Sydney’. It’s quite wondrous hearing this piece in an un-orchestrated context as the bounce of the piece and the lovely rhythmic structure are brought out so well by Harvey. The rhythmic and harmonic exuberance of “Jubilation Mantra” is a fitting finale to the Mantras & Night Flowers. It is followed by Edwards’ Piano Sonata (2011) which follows a more conventional sonata form than Vine’s. The varying modes and arrhythmia, features of Edwards’ works, which provide it with a uniquely Australian aura are features in his Sonata. The Allegro covers the length and breadth of the instrument and has a wonderful exuberance to it. Cards are held much closer to the chest in the slow second movement with its contemplative opening and warmly melancholic block harmonies. There are also harmonic and melodic references to his Dawn Mantras –such a lovely place to revisit – before we return to the opening theme. Harvey’s timing is immaculate here. The third movement expands on a children’s piece by Edwards I have always loved. He combines elements of minimalism with references to more romantic and classical places. There is such vitality and joie de vivre in the cyclic nature of it. Edwards’ music seems quintessentially Australian to me. It captures the clarity, the asymmetry, the vitality and the space. His music is full of openness and optimism. Vine’s writing is quite different. In his Piano Sonata No. 1, he works his way into the main theme from different starting points. It is as though we travel with him as he sifts through sound fragments, gradually merging, discarding, re-shaping until we “arrive” at the musical destination. We luxuriate in this sonic place, this fully formed “being” before we are taken in another direction, then gradually returning to the main theme for another hit. It’s incredibly special because Vine’s music is full of trajectory, momentum, so the journey’s the thing. It is also very complex and it is so obvious that he just loves sound, the texture of it, the expressive potential and the opportunity for interplay that combining sounds in space and through time provides. The Sonata was written for Michael Kieran-Harvey. Here Bernadette Harvey shows the wonderful technical prowess demanded by this piece and also captures the required expressive intent. Equally she articulates the sighs in the moments of stasis. Vine loves scalar passages leading to pivotal two or three note points of cadence. They are here in abundance in the first movement. Ravishing. Although in two movements, the main theme from the first is explored again at the beginning of the second, which commences with a sense of addictive menace (knowing the rabbit hole can only lead to mischief, but having to go there anyway). It becomes jazzy and voraciously romantic as it attempts to lead us back to that luscious theme, but we are allowed only a distant taste of it and instead are left with a slightly forlorn, but nonetheless beautiful, impressionistic resting place. Some of Vine’s favourite turns of phrase are explored in The Anna Landa Preludes and indicate the incredible range in his oeuvre. We have the fabulous feel of the tarantula on one’s skin that Harvey elicits in her interpretation of the Tarantella and the evocation of ‘lerve’ with a small dipping of the lid to Gershwin in its use of lush chords and varying favourite sonorities from Vine’s Piano Concerto No. 1. He messes with Bach in his Fughetta and with the listener in his Divertissement, a play on life if you will. How many emotions can we cover in two minutes? But Vine plays a straight bat with his closing Chorale, with a gorgeous modulation and total zen feel. Harvey milks this final piece with perfect expressive judgment. How lucky are we to have the opportunity for this experience? How lucky are we to have these incredible musicians?